The holiday hustle is in full swing around here. There are gifts to buy and wrap, cookies to bake and share, and loads of cleaning to do to get ready for the friends and family that will come calling. This year I am not sweating it, because I have a secret helper at my disposal that keeps my linens, clothes and tree skirts looking great, and it can even lend a hand with household cleaning. I am a BIZ Stain Fighter Ambassador. I was compensated to write this post, but all opinions are my own. I have been using BIZ all year. I used it to keep my kids looking great after ball games, to get food stains, paint and marker stains out of clothes, and even to clean up my house. Now that the holidays are here, Biz is my trusty helper again. 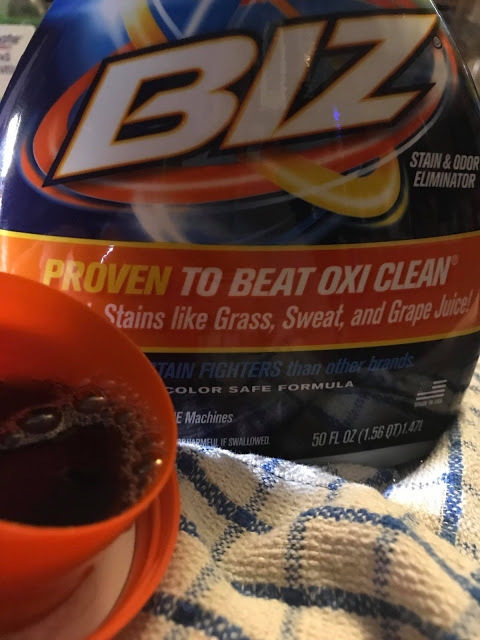 Biz has more stain fighting ingredients, this makes it a really great helper for laundry and more. It can tackle greasy food stains as well as juice or chocolate stains. No matter what delicious fun comes near my linens and clothes, handmade rugs and one of a kind tree skirt, BIZ has my back for easy and stress free stain removal. It is as simple as adding Biz to the wash and forgetting about it. This year as I prep for the holidays, I am using Biz along the way. My kitchen and bathroom are sparkling and inviting and my baseboards? They are so clean! All I did was dissolve a little Biz in warm water, then clean, going over it all again with a damp clean rag. Biz is inexpensive, it is available almost everywhere and it can multi task all over the house for a clean that is company ready. I love that I can spend a few dollars and get a product that works in so many ways. If you use Biz around the house, share a cleaning tip with me for the holiday guest season.